A customer-friendly and individualized future is what Limor Schweitzer has in mind. As an expert for 3D printing he explains the advantages of this technology and its impact on the way we produce and consume. 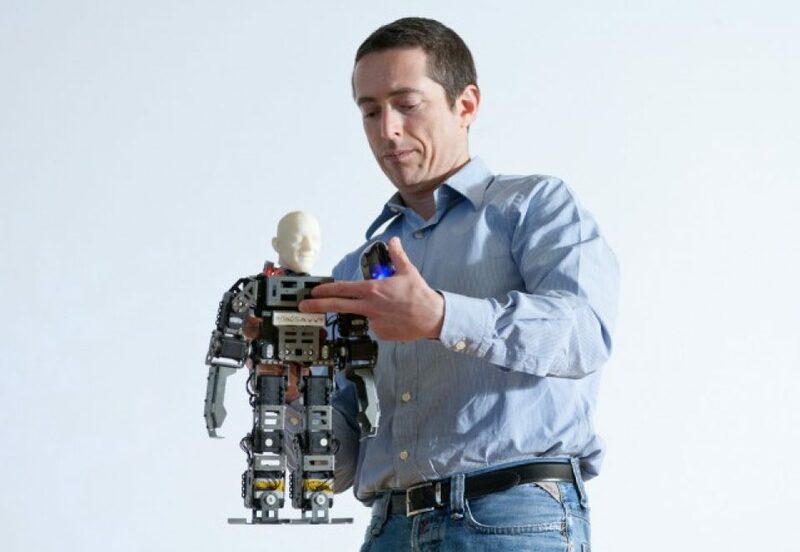 Limor Schweitzer of Robosavvy amazed the crowd at NEXT13 with his presentation of a 3D-printed dancing robot. For him, robotics and 3D printing are the two trend topics to watch. In this interview he explains why. Currently, everybody is talking about robotics: What's the fascination? Limor Schweitzer: Robotics fascination has been around forever. Throughout history people and animals were enslaved to work for a handful of other people. Modern day automation serves the same purpose but the beneficiaries are no longer a handful of people, but rather big parts of the human population. While we tend to associate the word robot to computerised mobile autonomous entities, robots are actually already in our daily life in the form of washing machines, cars and vacuum cleaners where a computer takes hints from humans about what needs to be done but ultimately decides what the motors should do based on other sensors and optimal strategies. So the trend of fascination with robots is evolving. A commercially viable robot servant that could use our human tools and help around in the house, factory or farm would probably be very popular. But due to the use of motors and the risk of powerful automatons mixing with humans, this evolutionary step can not happen all at once. The intermediate steps will consist of robots that can do single tasks and will not use utensils designated for our hands and posture. In my opinion the intermediate steps towards the utopian world of automatons will consist of tools that do specific things in a new and clever way rather then robots that use existing human tools. In addition, the entertainment world will see more experimental robots that show the promise of the humanoid robot performing in a human like fashion. 3D printing will change this culture to allow for replacement parts to be manufactured or enhanced at home. 3D is a huge trend these days. But whereas 3D movies are very popular already, 3D printing hasn't got off quite yet. Limor Schweitzer: 3D printing can be seen as technology that will ultimately localise manufacturing and customisation of any product, be it a piece of furniture or food. Currently, 3D printing is targeting education (and hobby) and engineering. It allows easy prototyping and lets more people be creative in more ways similar to what happened previously with color printers, computer image editing and digital photography. Most people today do not engage in manufacturing spare parts for things that break around the house. Instead they get a replacement part or buy a new item. 3D printing will change this culture to allow for replacement parts to be manufactured or enhanced at home. It may change the design of some of the items we buy to be more customisation friendly. But today, there are still software tools missing that will allow more people to make use of 3D printers. How could 3D overcome the plastic exclusiveness? Will we be able to 3D print premium material in the future? Limor Schweitzer: The plastic printers (robotised glue guns) are popular because they are very inexpensive. There are industrial 3D printers that can print practically any material but they are expensive because the market for their produce is limited and those who need their produce are willing to pay a lot. The hobby market is thriving with creativity and in fact, there are already hobby 3D printers that produce objects in wood and metal. Within a couple of years the hobby and desktop printers will be able to print in various materials for the same inexpensive cost as ABS and PLA plastic of today. In my opinion the biggest impact will be in design and manufacturing, opening up design and engineering capabilities to everyone. Which industries and fields will 3D printing impact the most? Limor Schweitzer: In my opinion the biggest impact will be in design and manufacturing bringing opening up design and engineering capabilities to everyone. Currently, design prototyping is done anywhere but mass production is done primarily in China. The end product is sold as a single unit. In the future that single unit can be part of a "lego" framework allowing more local customisation whether by individuals or professionals. Imagine IKEA furniture allowing additional customisation of internal and external features through 3D printed parts that can be customised by the end users. In your opinion, what is the biggest and most important challenge of our time? Limor Schweitzer: The population on the planet is growing exponentially. These are largely people who consume industrialised mass-produced products but their aspiration is to have more individualised choices and spend less time working. Therefore I believe 3D printing and robotic technologies can be fundamental in making more people fulfill their aspirations. Limor Schweitzer: ...crowdfunding-driven creativity, proliferation of robotics technology in entertainment and personal use.